Tom is in a helictoper, heading to the emergency. Tom : (repeats) I’m calm, I’m safe.. Colleague : Why did you take this job? Tom : Turns out it doesn’t work! Tom Kent specialises in Paediatric medicine. 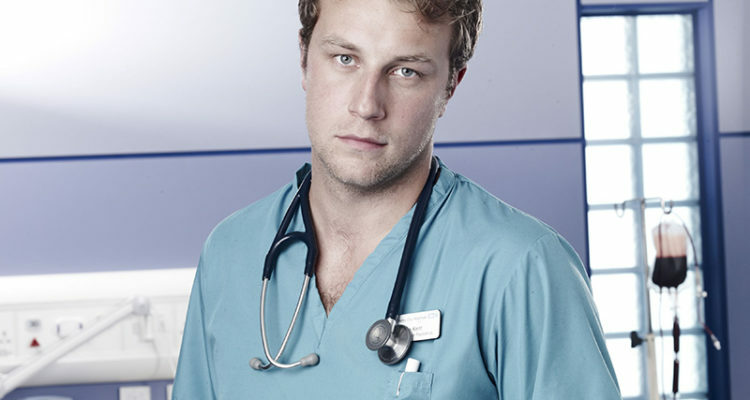 Prior to Holby, he was working on a six month rotation with Helicopter rescue, despite being afraid of flying. 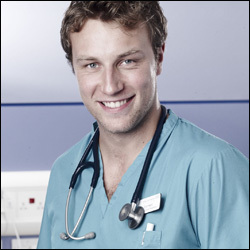 Tom is gentle, calm and excels in his treatment of patients, particularly children. He will always go the extra mile for his patients. Tom finds his maturity at work doesn’t always carry over into his private life, which he prefers to keep quiet. Tom makes a dramatic first entrance by helcopter in S26 E17, following a car accident on a motorway. A gas explosion continues to push the medics. We learn Jordan had previously offered Tom a job, which he turned down. This time, Tom agrees to join the team. In S26 E18, Tom soon finds he has a mystery on his hands when a family who were involved in the explosion end up back in the ED with unexplained injuries. But when the young son of the family is kidnapped, all becomes clear, and the child faces extreme danger. In S25 E23, Tom tries to get to the bottom of a family’s complex web of lies when a teenager falls of a road bridge. In S16 E26, Tom treats a school girl, Alicia, who claims to have been attacked at school. In S26 E31, teenager Alicia is back in the ED after collapsing at school and Tom is determined to get to the bottom of her symptoms. But shrewd Linda believes that Alicia’s problems are psychological and that she’s developed an unhealthy fixation on Tom. Tom is forced to take a step back and see what’s really going on. S26 E17 – Tom arrives by air ambulance to assist with a gas explosion. S26 E31 – Tom learns a young patient has an unhealth fixation with him and steps back.